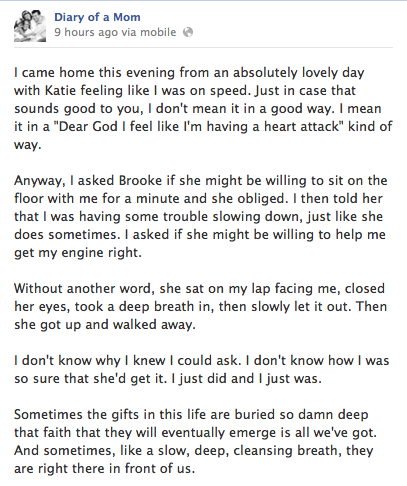 The breathing thing is what really touched me. I know so much about having to cope with things and even when I can’t explain, I can show how to do it. But people hardly ever ask me. Not meant as criticism, it just makes it more special when someone does ask. It feels good to be able to show the things I’m good at. It was the new soundtrack — the one performed by the actors from the revival, and it was the first time that Katie was hearing it. While the songs were largely the same, there were some notable changes. Katie asked me a question about the song that was playing. And she did. And Brooke knew the answer. And told her. Because SHE knew. So SHE was the one to ask. I realize as I type this just how NOT revelatory it sounds. You have a kid obsessed with something. Your other kid has a question about it. You send one to the other to answer the question. Duh. Well, maybe not so duh. Brooke needs help with a lot of different things. She wasn’t born hard-wired with many of the skills that the rest of us seemed to be. Language is one of them. It can be hard. So we might not always think to ask. But we should. Because over the years, she has acquired a whole lot of knowledge about a whole lot of things that the rest of us don’t have. She can tell us that Dora the Explorer’s last name is Marquez and that her sister’s and brother’s names are Isabella and Guillermo. She can rattle off the Godpsell songs in the order in which they are sung in the show (don’t forget the reprise!) and she can tell us that it’s different than the order in which they are played on the recorded soundtrack. She knows how to spell every kid’s first and last name in every class she’s ever been in and she can tell you what day of the week it was when there was a fire drill in her school in kindergarten. She knows stuff. But she won’t tell us any of it if we don’t ask. She just won’t. In addition to what she knows, she can also DO some really incredible things. Like really, really incredible things. Like things that most adults, autistic or otherwise, can’t do. Like find her calm when on the brink of a meltdown. Like manage to communicate what she needs even with limited access to speech. Like turn chunks of dialogue from television shows and movies into intelligible language. Like overcome her greatest fears. Like do math even when every sense she has is under assault. My kid has skillz, y’all. And even though she may not have the words to describe them or to TELL us exactly what we might need to know at any given minute, she has the ability to teach us so damned much. We just need to remember to ask. It seems so very simple when you put it that way. We just need to remember to ask. I feel really shy about my comment provoking such a response from you. But also happy and proud. It’s awesome. And you have the madd skillz of taking some words and transforming them into far more words that make so much sense and illustrate your beautiful connection with your child. It’s awe inspiring. So many feels! My 9yo has lots of similarities (language-wise) to Brooke. Sometimes when I ask him a question, trying to understand something better or get more details to a story, he will quickly say “I don’t know! I don’t know!”, but I am quite certain he *does* know. (Kind of like when Jess was trying to figure out what was different about the goldfish cracker packaging, I think I recall Brooke responded in a similar way.) For example, for a long time (and still sometimes), if I asked him what a classmate’s name was (and like Brooke, he knows the first and last name of every kids he has ever met), he would say “I don’t know! I don’t know! Stop saying!” Recently we’ve found that if I text him the question, he will often text back the answer. He just does’t want to say it aloud. I get the feeling that it makes him uncomfortable to say some things out loud. Not bc of fear of judgment or anything, but bc it actually makes him PHYSICALLY uncomfortable to say it. Like, it bugs his brain or something. I always respect his refusal to respond and never press, but just wondering if you can give any insight into what’s going on. I know you don’t know my son and everyone is different, I was just wondering if you had any ideas? I get that too! My 6 year old (PDD-NOS) doesn’t get upset about it, but for him it seems that “I don’t know” means “I haven’t processed it yet” or “I don’t have enough info from your question to answer” – or in the case of doing something that he wasn’t supposed to do it seems to mean “I can’t lie about what I did but I’m not ready to talk about it.” I like this idea of writing/typing instead – thanks for that inspiration! Ariane from Emma’s Hope Book has written a lot about the unreliability of speech as well. Your story reminded me of one of her posts, http://emmashopebook.com/2013/08/27/speaking-vs-typing/. I don’t know what causes it, for me it seems to be a mix of not understanding the question, having the question asked at the wrong time when I’m already dealing with something else, knowing my own words sometimes seem to come out the wrong way (at least as judged by the incomprehension it causes in others), and the ENORMOUS pressure to give an immediate answer. Especially the last one. There’s been some experiments done with forcing children with learning difficulties and developmental delays to wait 5 seconds before they’re allowed to give an answer, or providing some sort of resistance like having to hold one end of a rope while you’re pulling on the other end (Ariane has written about this too recently), and funnily enough that seems to help enormously in finding words to express their ideas. I think it’s the time aspect most of all, the security of knowing that you don’t have to find words RIGHT AWAY because if you don’t give an answer immediately, people will get annoyed or walk away. (Try it. A couple of seconds seems an uncomfortably long silence to most neurotypical people). Wanted to add that the pressure to give a reply quickly also means that the answer I might give in that time frame might be completely incorrect and bear no resemblance to the thoughts I’m actually thinking. I feel the need to just get some words out, ANY words that will satisfy the person asking the question. “What’s your favourite colour?” Erm… ahhh… I don’t know… blue is nice… all colours are nice… how am I supposed to choose… bugger, they are looking at me in that way… better say something quickly… “RED!” No no no that is not my favourite colour… I like red though… but they’ve stopped asking. *Give her time! – This is HUGE. Brooke needs processing time. If you ask her a question, WAIT an almost awkward amount of time (and then just a little bit longer) before asking it again or prompting her for an answer. Please, click on the following link and read the post there to get a better understanding of what this feels like from the inside out. Pretty please? Oooooh, great post by Amanda. I’m familiar with a lot of her writing but this is a new one. Thank you for the link! LOVE that post by Amanda! I refer back to it frequently. Jess, I’ve been following your lead and we use texting more and more. (Like, I’m on my phone on the couch and ds is on his iPad on the other couch and, we text!) Has been hugely transformative, even just for fun chit-chat stuff. Autisticook, that makes so much sense, about feeling the pressure to give an immediate answer. So even when I’m asking (what I feel is) an innocuous, low stress question, it’s the perception that a quick and correct answer is required that leads to the “I don’t know!! !” We do try to use more comments than questions, to decrease that stress, so I might say, “I wonder what that boy’s name is…..” and wait, and wait. The answer often comes. 🙂 Your replies are really helpful, thank you! Will def check out Ariane’s links too, her blog has been on my list of “must reads” for a while. Thanks!! Yeah, I am also really bad at immediate responses. Sometimes I just say things, anything, something to get people to stop looking at me and waiting for me to answer. As a corollary to that, kids tell us what they need/want, we just need to listen in the language they are using. We practice meditation and mindfulness with our children and breathing, deep breathing…it’s transforming. I always ask my son which bus we need to take when I don’t know. He always has the right answer – I don’t even bother to check anymore! He’s five. It’s great to hear that Brooke is doing so well. Lots of love to all in this community. I don’t often join in, but it means a lot to me. Hopefully there is a consulting firm in her future, i definitely need an expert i can call up with questions. Brooke skillz: in effect. I have learned to have patience when asking my kids any questions at all. Some days they still can’t give me an answer but most of the time I can get some form of a reply if I just wait. I’m still working on teaching my relatives and their teachers, etc., to wait for an answer. People are so impatient! What she has most that makes all her skills come alive is the unquestioned love of her family and especially her Mama. That sets the stage for all the answers that can be offered. 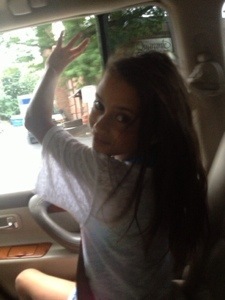 What a wonderful child and how fortunate she is…..